This March will mark what has become an SAS Intermediate Tradition. 5th grade students travel by wooden longboats to an Indonesian village for a cultural exchange that leaves both groups impacted. It’s hard to believe that within such easy reach of Singapore the group can step into a village that feels like it comes from another time period. SAS teachers and students are not content with the status quo and have partnered with the Telunas Center at Telunas Resorts to develop creative ways to consistently engage both the community and students in the development process. See the full article or visit our contact page to inquire on how your school can be involved in service learning the communities surrounding the Telunas Center. “Being a part of an ICI (Pt. 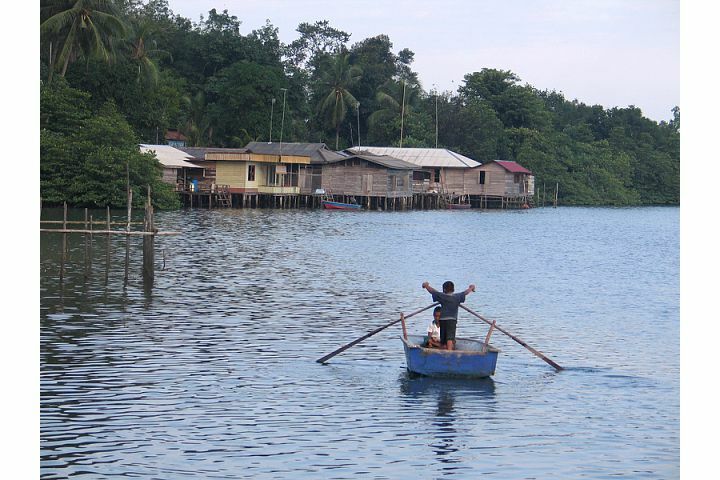 Island Connections Intl./Telunas Beach) ethno-tour has been one of the greatest experiences in my life. It offered me the chance to see a side of Indonesia that most foreigners don’t have the chance to see. Yes, there were the lovely beaches, the warm sun and the great food at Telunas, but I enjoyed the home-stays on the islands most. It was eye-opening to learn a wide range of things about the Riau Malay people. This included talking politics and economics with an island’s RW (community leader) to talking about wedding festivals with the women over lunch. However, a lot of what I learned was nonverbal. I saw first hand the needs of the communities and yet the benefits of their customs. Mandis (showers), which they take twice a day, for example, are key in keeping the children clean. “On September 2, 2010 the senior class of Dalat International School climbed into two boats that would carry us away from our idyllic vacation at Telunas Beach and toward an entirely new and exciting experience. We were headed for Pulau Jang, an island village just fifteen minutes away from the resort. Some of us were nervous about the day ahead, teaching English to schoolchildren using the few Indonesian phrases we carried with us on laminated cards, following new cultural rules we’d learned the day before, and helping to dig an irrigation ditch without drinking any water, out of respect for the people of the village who were observing Ramadan. When we arrived, we were greeted by lines of waving children in brightly colored school uniforms. We were ushered into the school building and our day began. 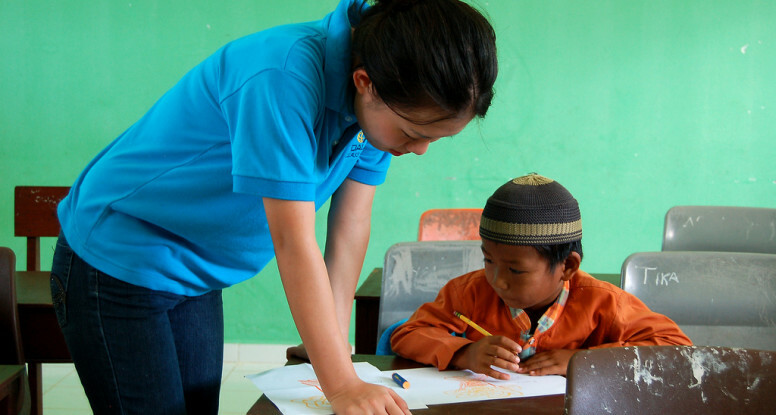 At the school, we split into teams of four spend the morning teaching English lessons to the students. Our first lessons were challenging. We found that we knew how to ask the children their names, but not what their favorite sport was. We could ask them to repeat English words, but didn’t know how to ask one student to come to the front of the classroom. With help from the Telunas staff, we learned as the day progressed, and were able to work with each other and find creative ways to communicate. Every Dalat student would agree that we learned more than we taught that morning. In the afternoon, we returned to the village to help dig and lay cement blocks in an irrigation ditch for the village. We were all excited to see how members of our class stepped up, volunteering to do tough jobs like mix the cement and lay mortar between the blocks. We had to be reminded to take breaks and let other students take over. The experience brought us together and cemented strong relationships within our class. 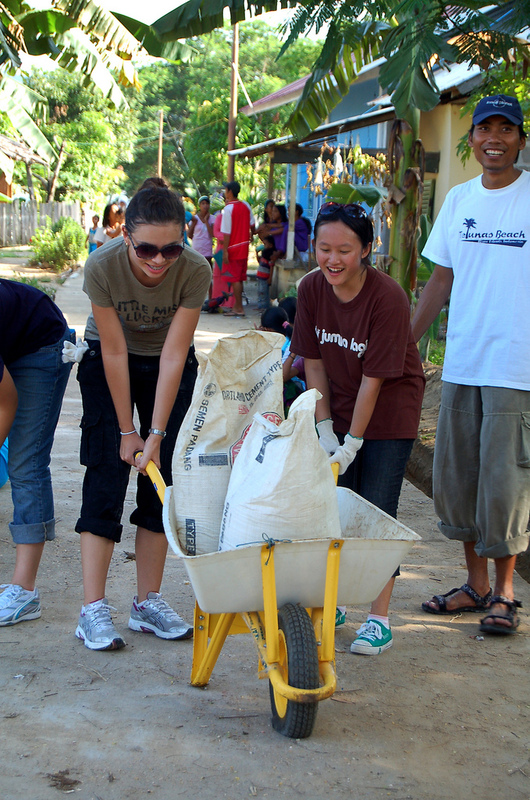 “The most memorable experience for me was the service project. Meeting the kids after school was very fun and eye-opening. What I appreciated most about Telunas Beach was how friendly the staff was and their dedication to their jobs.” – Rachel L.
Setting aside the fun activities of being at the Telunas Center (at Telunas Beach) and working through their week-long writer’s workshop (formerly known as camp), the students of Singapore’s Swiss School took the time to perform a community development project. Their project was to help a local school on Pauh Island to build a canteen. The children had enjoyed themselves so much that time passed by and it was time for lunch. The school staff had prepared traditional cuisine for the Swiss School boys and girls to enjoy. By that time, many local students were already anxious to continue having fun with the Swiss School students. However, it was time to go home and the kids would have to leave the island. The students and community will always remember the experience and good times that were shared. Telunas Beach is proud and privileged to have hosted such a fun group of students and we would love to provide such experiences for your students. You can simply contact us to request further information to bring your school group to the Telunas Center.